May is a special month in Oklahoma; Spring has sprung, the weather is warm, and the trees finally have their leaves. It is not yet unbearably hot outside, and if you’re lucky, you won’t get hit by a tornado. It’s the perfect month for outdoor activities, especially if you’re heading outside with your sweetheart. When in love, a romantic picnic is the perfect outing for a warm May afternoon. So gather ye rosebuds while ye may, and head to your local park! Show your sweetheart just how much you care by preparing a homemade vegan picnic that is both delicious and healthy. The following Mediterranean-inspired menu will provide the perfect refreshment for a leisurely afternoon picnic on a beautiful Spring day. Why should you make that picnic vegan? A meat-free meal will leave you feeling full and energized, but not stuffed and bloated in case you wish to participate in some, uh, strenuous activities later on. Another great thing about a vegan picnic is that there is no pesky meat or mayo to go bad. Your salads and vegan victuals can sit out for hours, with little risk of foodborne infection – because nothing is less romantic than two people with gastrointestinal infections fighting over the bathroom. 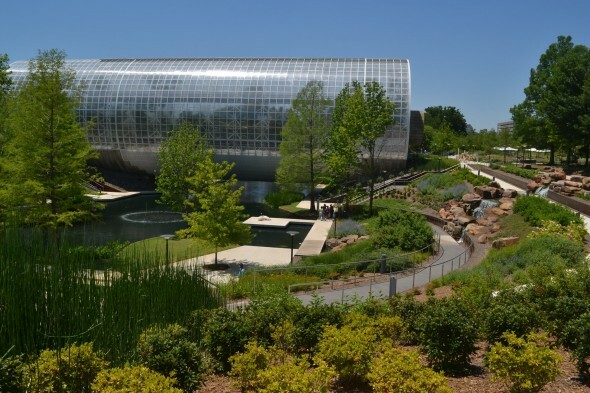 There are several parks in the city that are ripe for the picnicking, but your best bet for a good time is the lovely Myriad Gardens. This downtown locale will provide you with excellent people watching, interesting outdoor art and ducks, just in case the conversation flags or if you need somewhere to place your gaze, you know, between those shy moments you might still have in your budding new relationship. The following recipes are easy to make, easy to transport, and can be enjoyed at room temperature. The meal will also be complemented by some high quality olives for snacking. Don’t forget to bring an appropriate beverage, such as a bottle of refreshing iced tea, or some other concoction poured into a Nalgene bottle, which is one of the safer brands of plastic bottles when it comes to chemical reactions. This is to say it will not leach chemicals into your water or beverage if used at the designed temperatures. So get cooking and get picnicking! May won’t last forever, and soon it will be too hot to leave your house in the daytime! 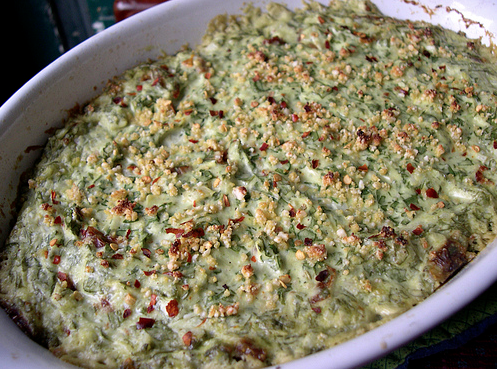 Traditional spinach-artichoke dip is chock full of fatty, cholesterol-laden ingredients. This lighter version still tastes rich, but packs a nutritional punch. A sprinkle of vegan cheese on top adds flavor and makes the presentation prettier, but is totally optional. Photo via The Vegan Mouse. Her recipe also includes the option of chopped sundried tomatoes and chili flakes as a topping option too. Preheat oven to 350°F. In a medium-sized saucepan, heat the oil over medium heat and sauté the onion and garlic until fragrant and translucent. Add the drained spinach and artichoke hearts and fry for a few more minutes. Transfer to a medium-sized bowl and set aside. 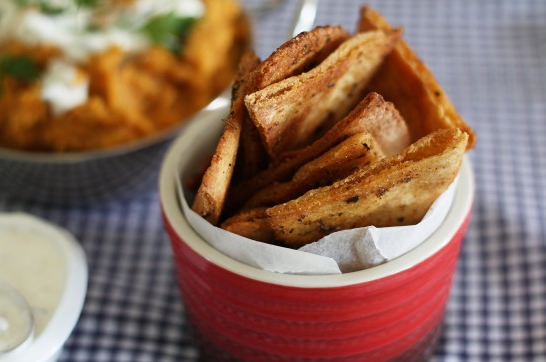 In a food processor, puree the tofu, nutritional yeast, vinegar and spices until smooth. Scoop into the bowl with the spinach mixture and fold to combine. Spread in a greased casserole dish. Sprinkle vegan mozzarella on top and bake for 15-20 minutes, until lightly browned on top. Enjoy warm or at room temperature. 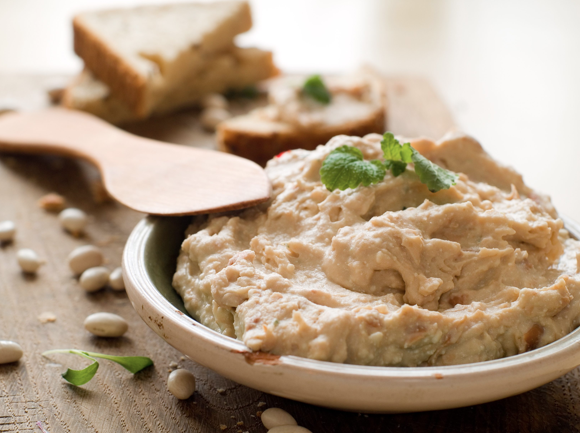 Hummus is usually a garlicky treat, but if you or your sweetie is not a fan, or there is some smoochin’ in your future, then this dip will be just as tasty sans garlic. Lots of people use pre-squeezed lemon juice from a yellow plastic bottle to make their hummus and those people are violating the sanctity had in years and years of Mediterranean knowledge. Fresh lemon juice is best, and this is especially true of its superior flavor should you choose to omit the garlic. Combine all ingredients except for the reserved chick pea liquid, in the bowl of a food processor. Puree until smooth. If the hummus is too thick, drizzle in the reserved liquid until it reaches a smooth and creamy consistency. Just like with the hummus, the scallions in the recipe are completely optional, in case you prefer your kissing partner to be not onion-flavored. Or there is the option of packing along some breath mints. 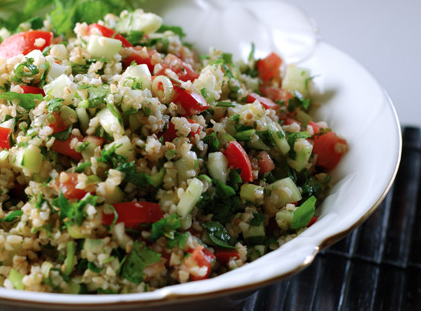 Measure bulgur into a large bowl and cover with boiling water. Stir with a fork and set aside for 1 hour until the bulgur is plump and room temperature. Add the remaining ingredients and toss to combine. The salad tastes best when refrigerated for at least 2 hours before serving. Less healthy, but more fun than plain pita bread, pita crisps are delicious by themselves, or with any kind of dip or spread. Use whole wheat pita to up their nutritional value. Just about any kind of spice mix will work, but garlic and salt is good standby. The dill helps you see where you’ve already sprinkled. Preheat oven to 400°F. In a small bowl mix together the salt, garlic powder and dill and set aside. Using a pizza cutter or sharp knife, slice pita rounds into 8 triangles. Separate the two halves of each slice by tearing apart at the round edge and lay smooth side down on a cookie sheet. If you have an oil mister, then fill with olive oil and spritz each triangle with oil. If you have a pastry brush, pour a small amount of oil into a bowl and use the brush to spread each triangle with oil. If you have neither of these kitchen implements, then cut your losses and buy some chips from a store. Using your fingers, sprinkle each triangle with the spice mix. Bake for approximately 7 minutes or until chips are crisp and starting to brown. Be careful, because they burn fast. Remove from oven and let cool on a rack or plate. Repeat with remaining triangles. Once the chips are completely cool, store in an airtight container so they won’t go soft prematurely. Strawberries and chocolate are a classic combination, but just about anything hardy can be dipped in chocolate, such as chunks of cake, bananas, pretzels or dried apricots. Wash strawberries and pat dry, leaving the green tops intact. Place a sheet of waxed paper on a flat surface or cookie sheet. If you have a double boiler, put about half an inch of water in pan, set the bowl on top of it and heat until over medium heat. If you don’t have a double boiler. Heat the water in a small saucepan and place a heat-proof bowl on top. Once the water is simmering, turn heat down to low and place chocolate in the bowl. Stir until it is melted and smooth and then turn off the heat. 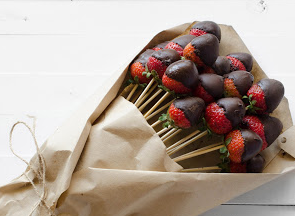 Hold a strawberry by the leaves and dip in chocolate, coating the entire surface. Place the strawberry on the waxed paper and let cool until chocolate is set. If you miss your window this month, a twilight picnic by the Myriad Botanical Garden’s amphitheater is also beautiful too. Photo via Oklahoma Arts Council. 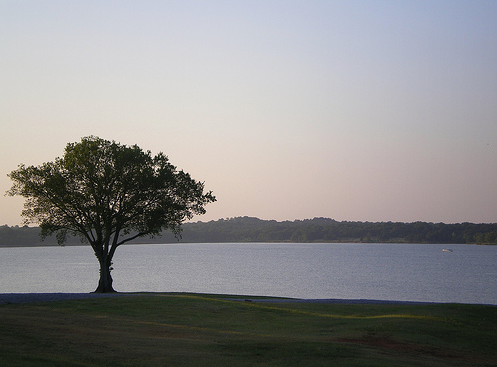 Editor’s Note: If you live in Norman, other cozy park options include Lions Park, Andrews Park, any little nook and cranny on OU’s campus, especially now that school is out, and if you want to get lost in the wilderness Sutton Park or somewhere out in Lake Thunderbird State Park would all be viable locations. 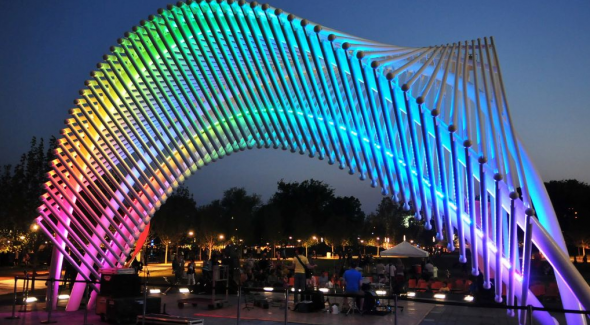 Tagged activities, Andrews Park, Chocolate Covered Strawberries, heat, Lake Thunderbird State Park, Lions Park, LOVE, Myriad Botanical Gardens, norman, oklahoma, options, Romance, Spiced Pita Crisps, Spinach Artichoke Dip, Sutton Park. Bookmark the permalink.